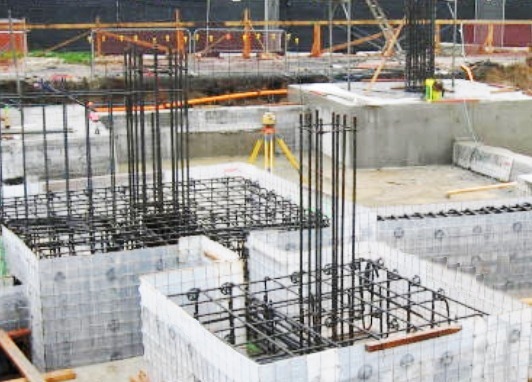 We know raft foundation is adopted when bearing area required to support superstructure loading is equal or close to available floor area. But let’s consider-required bearing area is very close to available floor area and we want to avoid raft; what should be foundation design consideration? This means there are very small gaps between footings or footings have to be placed in very close spacing. Sometimes footing may even touch each other. Now the question arises about interference effect. We will uncover the answer of the doubt about their structural behavior. This effect of interaction between footings has been considered in many studies of researchers. They found a parameter that defines whether the interference should be considered seriously or not. The parameter is angle of shearing resistance. When the value of angle of shearing resistance is low, the interference is too low to be considered negligible. In case of high values, this effect is significant. When a foundation surrounded in both sides by foundation, this effect is very significant. Another parameter that influences interference effect is length to width ratio of foundation. When the length to width ratio tends to unity, this effect is found reduced. In analyzing punching shear failure, interference effect needs not to be considered. For these reasons, it is recommended not to consider in design and analysis. However, a design professional should be careful about possibility of existence of them in special circumstances.